Imperial Sugar Factory Explosion That Killed 14 In Georgia Was Avoidable : The Two-Way Last year's deaths of 14 sugar factory workers in Georgia could have been prevented if manufacturer Imperial Sugar had taken available steps to reduce the presence of sugar dust in its facility, according to federal officials. Aftermath of the explosion and fire at the Imperial Sugar Company's plant fire in Port Wentworth, Ga. which killed 14 and injured scores. Last year's deaths of 14 sugar factory workers in Georgia could have been prevented if manufacturer Imperial Sugar Co. had taken available steps to reduce the presence of sugar dust in its facility, according to federal officials. 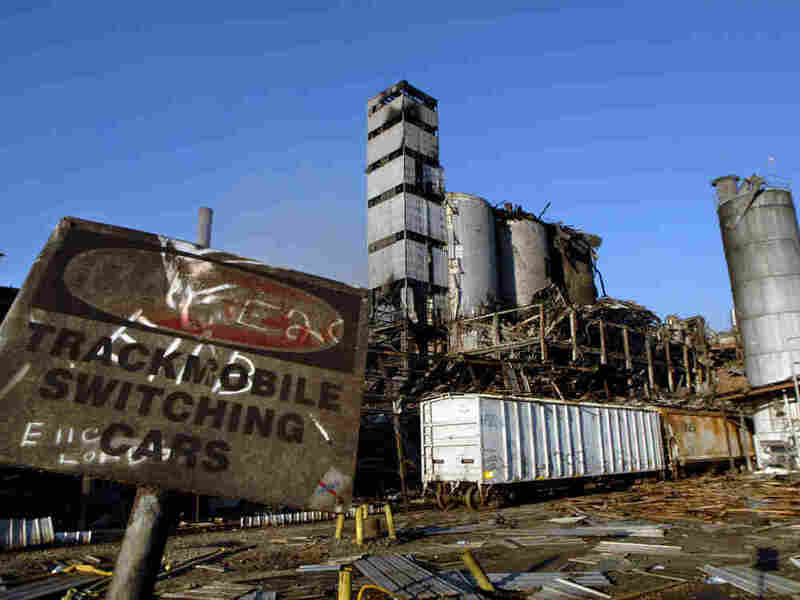 The U.S Chemical Safety Board found that the explosion was entirely preventable. It found equipment was not designed correctly or maintained properly which allowed sugar dust to pile up around the plant. The board also found written warnings about the hazards of combustible dust in company memos dating back to the 1960's. According to the report, "Imperial Sugar management was aware of the hazards associated with combustible sugar dust, but in the absence of any major catastrophic incident during many years ... the hazardous conditions went uncorrected." Last year, OSHA fined imperial sugar for more than 200 safety violations at its refineries in Georgia and Louisiana. Since the 2008 explosion, families of those who died or were injured have filed more than 30 civil lawsuits. This new report could bolster their cases. Investors immediately saw the implications for the company's finances following the chemical safety board's release of the report. At about 1:21 pm ET, Imperial's shares had lost 18.4 percent of their value, with the share price just under $12 on 1.2 million shares traded. The safety board has the documents, images and videos related to the explosion on an ftp site.